Made of mild steel, fully heat-treated, very fine black backed enamel finish, white markings. Dual scale on both short and long arm. SHINWA STEEL RAFTER SQUARE is rated 4.0 out of 5 by 1. Made of mild steel, fully heat-treated, very fine black backed enamel finish, white markings. Dual scale on both short and long arm. Rated 4 out of 5 by MistaToby from Good Quality! Fits my needs! 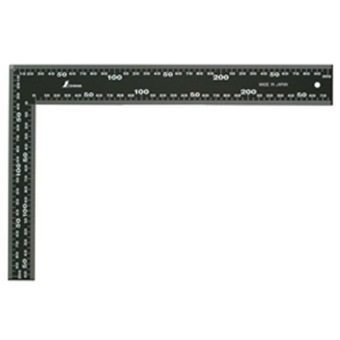 Bought this to fulfil a need for a bigger square than the normal 30cm ones. This fits perfectly and it will probably last a really long time!